Today is Day Two of OnStage. I can’t share any sneak peeks of upcoming products yet, so instead I’ll share one of the swaps that I took with me. Swaps are a huge part of OnStage. It’s one of my favorite ways that we share ideas with each other. The idea is that you make a bunch of cards then you trade them for cards made by other Demonstrators. It’s sort of like exchanging business cards, but instead you exchange a real card. It’s kind of funny walking around the Convention Center, you can hear people calling out “Swapping? Anyone Swapping?” Demonstrators will swap anywhere… restaurants, hotels, on the streets, and even in the lines for the bathroom. With swaps, you can either make your cards all the same or make them different. Most of generally follow the “rule” that it should be current products only, with 1 or 2 layers with an embellishment or ribbon. Swapping cards with other Demonstrators is a great way to get lots of different ideas using different styles and products that we may not personally own. 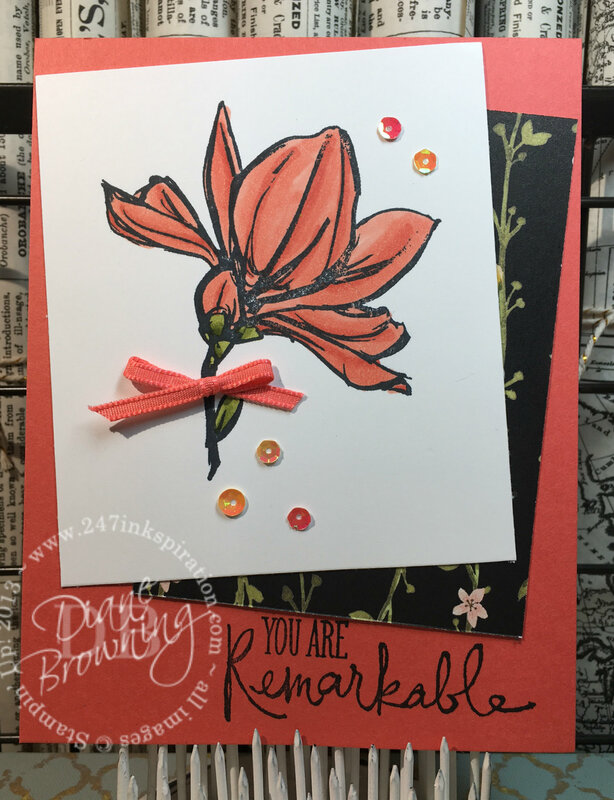 My swap uses the Remarkable You stamp set. The oversize flower was perfect to color with our brand new Stampin Blends markers. Oh my goodness! These markers are amazing. I did note they take a little bit of practice. My flowers that I colored early on were not quite as good as the later ones. I did go back and re-blend some of the earlier ones to fix visable streaks. The Whole Lot of Lovely pattern paper coordinated beautifully with the Calypso Coral flower that I colored. I took advantage of the pattern paper sale last month and purchased an extra pack of this paper just so I’d have enough to make swaps. I hope you enjoyed today’s card. I will have a recap for you of OnStage just as soon as I can share sneak peaks of the upcoming new products. Let me reassure you now that you are going to love what is coming. November Specials! 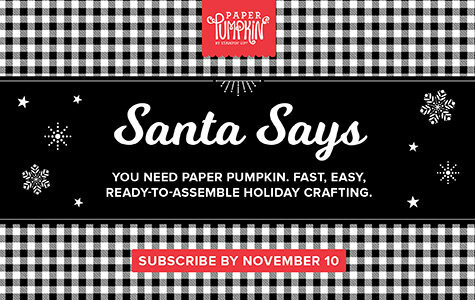 Did you get the October Paper Pumpkin kit? November’s kit will coordinate with October. However, if you missed out on October, don’t worry, you can still get November’s kit. BUT, today is the last day to sign up to get November’s kit in the mail.